As one of the reliable roofing contractors in Northern Virginia, we understand our business will not exist without our clients. And those clients want quality service; otherwise, they will take their business somewhere else. This is why we take pride in attaining an A BBB rating. The Better Business Bureau considers the time the business has been in operation and looks for information from the company itself or any public source. When they don’t get the information they need, they will assume that the business is newly opened. Peak Roofing Contractors, Inc. was founded in 2006, with our owner Buddy Riggleman offering over 20 years of experience to the company. This means we know what we’re doing, and BBB knows we’re not just a storm chaser. Because customer satisfaction and opinion are important in keeping the reputation of roofing contractors, we give our best to each and every project. This means that even if there is a complaint filed against us, we seek to resolve it in a timely matter. BBB looks at the type of complaint filed against a company and sees the efforts they did to resolve the issue. Of course, it’s better to lessen the number of complaints, and we aim for that. Some businesses may be operating under false pretenses or may not be complying with the law. Unlike them, we have a reputation to maintain and we practice transparency in everything we do. This means we’re readily available to answer your queries even before you sign a contract with us. BBB gives the highest rating to those who give complete and accurate information about their products and services, and we have that A rating to prove our compliance. We value the A rating given to us by the BBB, and we also value customer opinion. This is why we take the time to talk to you before starting the project, to answer any questions you might have. 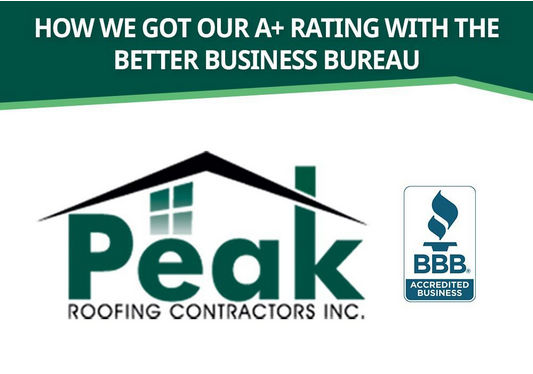 Peak Roofing Contractors, Inc. is just one of many roofers in your area but we’re proud to have the highest rating from BBB. Not all companies can be as proud. Call us at (703) 745-5153 if you reside in Northern Virginia or Manassas, VA.